Brazilian President Michel Temer has been charged with accepting bribes by the country's chief prosecutor. He is accused of receiving money from the boss of a giant meatpacking firm implicated in a corruption scandal. 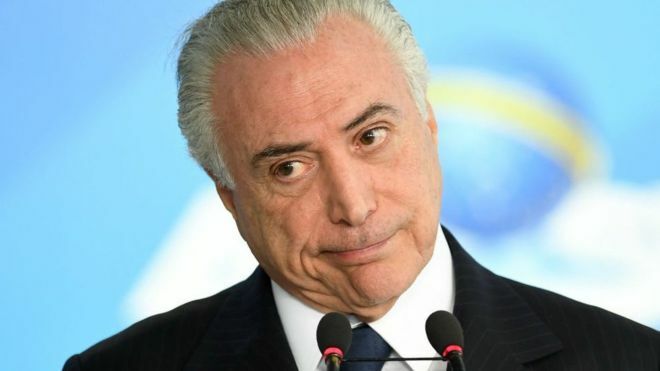 Mr Temer denies any wrongdoing. The lower house would vote on whether President Temer should be tried. Mr Temer has vowed to prove his innocence. He has faced a slew of accusations since taking office last year but these are the first formal charges against him. The move follows the release of an audio recording in which Mr Temer appears to be discussing bribes in conversation with Joesley Batista, the chairman of the meatpacking company JBS. If the corruption case reaches the lower house, Mr Temer's coalition believes it can gather enough votes to block the two-thirds majority needed for a trial to be brought against him. However, President Temer is expected to face further charges in the coming weeks, correspondents say.